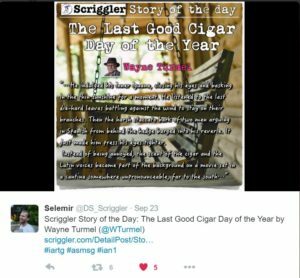 My little writing exercise, “The Last Good Cigar Day of the Year” was the “Story of the Day” on Scriggler.com. You can read it on the Scriggler site, along with the kind comments from total strangers. Yes, my neurotic need for approval from complete strangers is in full roar right now as I search for a publisher for my new novel. I’ll take this gladly….